Even standard polymerase chain reaction (PCR) technology should, in principle, boost weak mutant signals so that they may emerge from all the genomic noise emitted by wild-type sequences. Yet standard PCR, for all its sequence-amplifying and signal-boosting powers, is still a qualitative technique. That is, it can indicate only if a given DNA sequence is present or absent. But wait: What about real-time PCR, which is also known as quantitative PCR (qPCR)? True to its name, qPCR is indeed quantitative, but only if standard curves are used to convert abundance data—specifically, data about the rate at which abundance increases—into absolute concentrations. Granted, qPCR works just fine for many applications. After all, qPCR technology is mature, and qPCR systems are capable of high-throughput operation. Yet qPCR technique may falter in applications requiring extreme accuracy and sensitivity. In such applications, another PCR technique, digital PCR (dPCR), shines. With dPCR, extreme partitioning of samples into arrayed reaction chambers, usually droplets or microwells, ensures that any given chamber contains just one copy of the target sequence, or none. (Yes, the random nature of target distribution means that multiple targets may lurk in a single chamber, but statistical calculations can take such aberrations into account, never more so than when the number of partitions is large.) Because of its all-or-nothing (1 or 0) approach, dPCR may dispense with standard curves and their complications, and the count of positive signals is easily converted into an absolute number. This relatively straightforward approach delivers a high degree of accuracy and is suitable for challenging applications such as the detection of copy number variations (CNVs) and rare alleles, the analysis of nucleic acid scraps extracted from liquid biopsies, and the identification of elusive pathogens. Now dPCR is demonstrating its strengths in various applications. A sampling is presented in this article, which summarizes some of the most interesting developments cited at a recent BIO4 Summit, which took place in London and focused on qPCR and dPCR. According to Erin Zhang, Ph.D., product manager at JN Medsys, this company has developed a dPCR system that has a level of detection down to one copy of DNA per genome. The system, Clarity™ dPCR, can be used to detect DNA, cDNA, or RNA and accomplish rare mutation analysis, detect CNVs, and quantify viruses and bacteria. Nonclinical applications include food testing for contamination. JN Medsys’ system uses a “chip in a tube” or tube-strip format that combines the stability of existing droplet-based systems with the speed and workflow advantages of chip-based dPCR systems. The system can complete 96 reactions in less than four hours. The next generation of the Clarity™ Plus system can generate over 40,000 partitions per reaction, allowing multiplexed detection of four to six targets per reaction or 384 to 576 different targets in each dPCR experiment. The closed system environment reduces contamination and sample loss and increases the stability of partitions. Bio-Rad Laboratories’ Droplet Digital™ PCR (ddPCR) system partitions the test sample into 20,000 droplets; after amplification, the droplets containing the target sequence are detected using fluorescence. Like other dPCR technologies, ddPCR dispenses with normalization-to-control methods such as the use of reference samples or standard curves, giving it an advantage over qPCR. Dr. Patel said that although dPCR is being applied across applications like those for qPCR and next-generation sequencing (NGS), dPCR delivers superior performance in mutational analysis, detecting single nucleotide polymorphisms (SNPs) and other variants such as deletions, insertions, translocations, and fusions in the background of a lot of wild-type or normal DNA. “This ability to find rare variants is where dPCR provides a significant benefit, often log-fold improvements over other methodologies in this area while maintaining cost effectiveness and a simple workflow and turn-around time,” Dr. Patel insisted. Other applications of dPCR are detection of pathogens such as viruses or bacteria in the background of complex matrices and wild-type material; quantification of host-cell DNA present in biologic or other pharmaceutical products; and detection of donor-organ DNA in the blood of transplant recipients to monitor signs early organ rejection or organ failure. Oncology is a key clinical application of dPCR, for both mutation detection and copy number analyses. Bio-Rad has CE (Conformité Européene) IVD marks on an automated and a manual dPCR platform, available within Europe and parts of Asia. 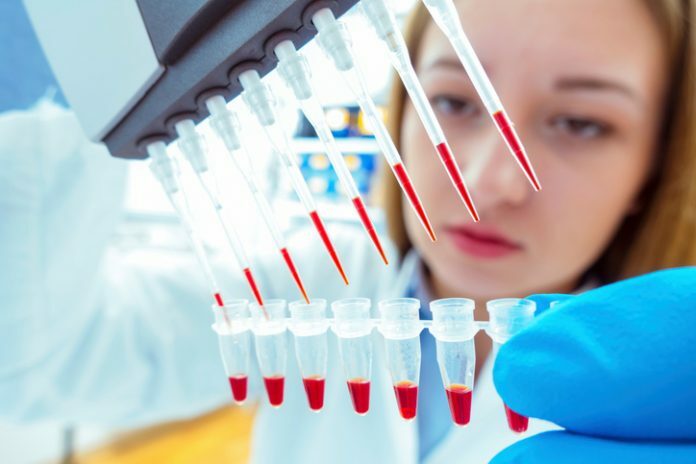 In addition to CE IVD marking on non-analyte-specific reagents, the company recently received a CE IVD mark on a test for BCR-ABL, the fusion gene driving chronic myeloid leukemia. Dr. Patel said that Bio-Rad is engaged with the FDA on obtaining clearance of the platform and the BCR-ABL test. The BCR-ABL test would be used to monitor patients who are on therapy; the levels of reduction of the BCR-ABL transcript during therapy are used to determine response to therapy. According to Dr. Patel, the sensitivity, accuracy, and reproducibility of dPCR in detecting BCR-ABL is enabling studies that look at whether therapy can be stopped in patients with very low levels of the transcript. Digital PCR is likely to be used to monitor minimal residual disease in other hematologic malignancies and solid tumors. Anthony Magliocco, M.D., a molecular and anatomical pathologist at Moffitt Cancer Center, described the use of dPCR to detect specific mutations in cell-free DNA in patients to monitor their cancers. The first assay being used clinically at Moffitt detects the EGFR T790M mutation to monitor lung cancer tumor burden and resistance to treatment with tyrosine kinase inhibitors. Moffitt is also developing an assay for BRAF V600E in melanoma and thyroid cancer. EGFR T790M is thought to be a resistance marker that occurs only after treatment of lung cancer with an EGFR inhibitor. Emergence of this mutation indicates the need to change therapy to an agent that can overcome this resistance mutation. “This absolutely guides treatment choice,” Dr. Magliocco pointed out. “That’s why we created the assay.” dPCR can also be used to monitor tumor load using a tumor marker that is not necessarily a therapeutic target, for example, the p53 protein. Dr. Magliocco said the advantages of dPCR include the small sample size needed and applicability to blood, cerebrospinal fluid, and tissue from fine needle aspiration samples or paraffin sections. “You can monitor changes accurately,” he remarked. “It’s also very cost effective. It’s high throughput. It doesn’t need any bioinformatics. At Cell and Gene Therapy Catapult, a center of excellence supported by Innovate UK, dPCR is being used in several applications related to gene therapy. Damian Marshall, Ph.D., a senior scientist at the center, said that dPCR allows measurement of viral copy number at the single-cell level in cell-based products for gene delivery rather than just looking at an average copy number for the whole population of cells. “The advantage that you gain is large enough that in the end, dPCR is more cost effective,” added Vincenzo Di Cerbo, Ph.D., analytical development scientist at the center. Dr. Marshall pointed out that for a more mainstream application (that is, an application more mainstream than cell-based therapies, which are used only in a few patients), modifications to the single-cell isolation step to increase throughput might drive down cost. The Catapult center is also evaluating dPCR for sterility testing for cell and gene therapies. dPCR not only detects contamination down to the single copy number level, it also distinguishes between live and dead microorganisms. Dr. Marshall pointed out that cellular therapies have a limited shelf life and are intended for seriously ill patients. The current “gold standard” compendial sterility tests were developed in the 1930s and require a 14-day culture period. For cellular products with a shorter shelf life, the product may be released at risk with a mitigation plan in place in case sterility tests fail, although by that time they would already be administered. While there are more rapid tests that can reduce test time to 2–5 days, the Catapult center is looking to decrease test time to four hours with a dPCR approach that can identify 99% of all bacterial and yeast species. The test is being validated by direct comparison to a compendial test for a cell therapy product.